Inject a little humor in to your Christmas cards. Sometimes the most fun part of having a toddler is surviving the adorably destructive and amusingly chaotic things they do. Spread the wealth and share some of your funniest moments in your toddler's Christmas card photo this year. 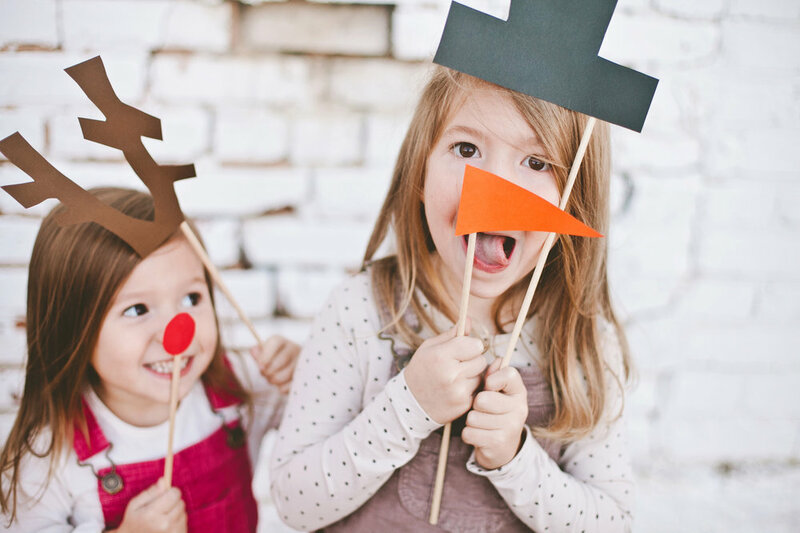 Use your creativity to come up with funny captions for your favorite photos or stage posed holiday card shots that are sure to elicit a laugh or two. Let your child help you. Imagine the delight your son or daughter will experience at such a young age to have a hand in actually creating your family's Christmas cards online. As you make your own holiday photo card, let your little one sit on your lap and choose some colors, backgrounds, or stickers to personalize the card from a child's perspective. When you have one child, it's a little easier to make your little one part of the entire process. This experience is meant to be shared and enjoyed together, and the user-friendly online software makes it easy to apply and remove changes at your discretion. Get even more creative with more kids. If you've got a toddler and an infant, consider playing up a little story between the two in your Christmas card photo. Some popular holiday card photos have shown moms and dads tangled in Christmas lights while toddlers try to send the baby back to Santa Claus. Others merely include the holiday photo shoot bloopers on one side of the card and the hero image on the other. You might go for the sheer emotion of it--crying, pouting, or overly elated toddler faces. Your family, your call! As a special finishing touch, give your toddlers some crayons and let them go wild coloring all over the envelopes for your Christmas cards. This youthful artwork is sure to bring a smile to their grandparents' faces before they even open up the cards. It's nearly impossible to go wrong when you have cute kids to put on the front of your custom Christmas cards, especially with those as young and unpredictable as toddlers. Best wishes for a merry holiday season!